Title: EYE - "DEMONSTRATION (H.U.S.H.)" 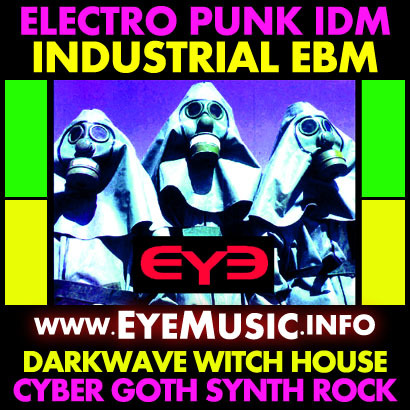 Genres: Electro Industrial, Synth Punk, CyberPunk, Cyber Goth, Electronic Rock, Electronica, Aggrotech, Dance Punk, IndieTronica, Glitch Hop, Industrial Metal, EBM (Electronic Body Music), Political Protest Music Songs, Social Justice Music, Activism, Musique Concrete... Australian American Bands Groups Projects Artists Producers (Sydney Melbourne Brisbane Adelaide Canberra Perth New York Los Angeles San Diego Newark Jersey City). Description: A collection of early "demos" ("demonstrations") recorded during 1993-1994 mostly on an 8-track analogue reel-to-reel at Community Radio 2XX's 'Studio C'; a few of these tracks were recorded on analogue 4-track cassette tape. These tracks were originally released on 1000 copies of the "Herd Under Social Hypnosis" cassette album. While there are a dozen-or-so earlier EYE demo-recordings that cassette album was the first collection of EYE music that was: i) commercially available (via indie record stores & mail order); and ii) sent to media (like radio & zines) for reviews and airplay. The most popular track was the thrashy cyberpunk-electro-industrial-metal piece titled "Grave New World". 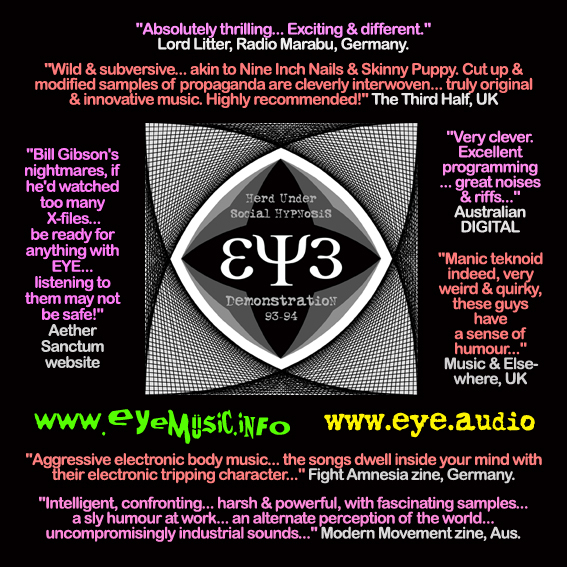 In the sense of gaining attention and enthusiastic support it was EYE's first "hit". Radio shows around Australia, even in Europe and the Americas, played it on air from the cassette! Over subsequent years numerous independent record labels, around the world, released it on their various artist compilation CD albums - constituting around 2500-5000 CDs. This collection was made available on BandCamp in early 2015. The track-listing has been slightly altered to place the '(anti-)propaganda soundscapes' at the end. Originally they were at the end of each side of the cassette tape. "Absolutely thrilling . . . Exciting and different." Lord Litter, disc-jockey on the Europe-wide Radio Marabu, Germany, 1996. "Bill Gibson's nightmares, if he'd watched too many X-files . . . be ready for anything with EYE, because listening to them may not be safe!" Aether Sanctum web-site, Perth, 1997. "... These wild and subversive Australians, EYE, also have their own subversive information service. 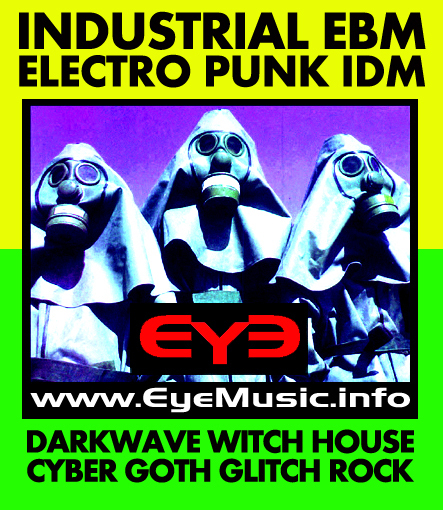 Eye succinctly describe their music as "propaganda-laden-cyber-neo-industrial-electronic-body-music". What we have on "Herd Under Social Hypnosis is noisy, abrasive, industrial dance akin to Nine Inch Nails and Skinny Puppy. Cut up and modified samples of propaganda are cleverly interwoven into their music creating an abrasive, industrial, frenzied and powerful media tool... eight tracks of truly original and innovative music. Highly recommended!" The Third Half, Scotland, 1997. "... intelligent, confronting... harsh and powerful, with fascinating samples... it really does make Nine Inch Nails sound lame... a sly humour at work... an alternate perception of the world you live in, as well as some uncompromisingly industrial sounds..." Modern Movement zine, Brisbane, 1996. "...They're very clever. Excellent programming . . . great noises and riffs..." Australian DIGITAL magazine, 1996. 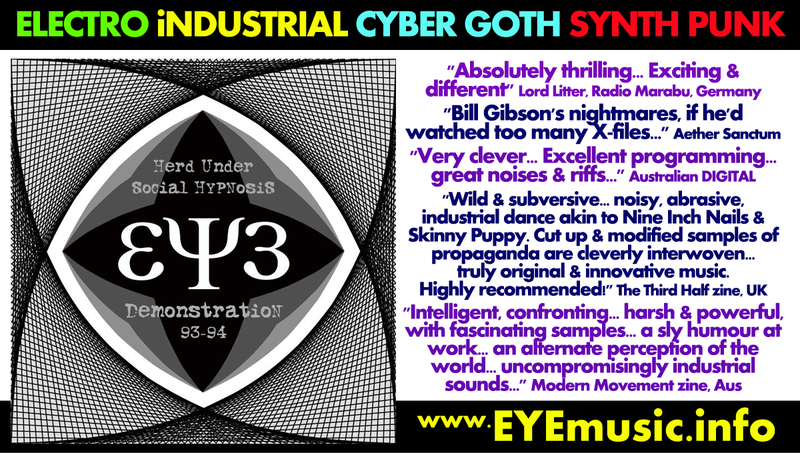 "... startling on several levels... very good at what they do... the cassette "Herd Under Social Hypnosis" is characterised by a variety which is absent from too many commercially available electro-industrial releases... EYE's music is unashamedly ideological, but in a way which complements, rather than detracting from, the songs. Causes which are taken up on the cassette include distaste at modern citizens' willingness to abandon individual thought to the corporate machine and tv culture, and opposition to vivisection and society's reliance on prescription pharmaceuticals." Peter Stills (aka the office goth), Woroni, student newspaper of the Australian National University, 1996. "... aggressive Electronic Body Music attacks.... professionally produced... the songs dwell inside your mind with their electronic tripping character, before they are spread all inside your body and soul!" Fight Amnesia zine, Germany, 1996. "... I'm born again, I had no idea that anything THIS radical was going on down under... Very hi-tech sound here, not a didgeridoo in sight, some beautiful synth sounds, muchly fast tekbeats, Gary Numan on helium vocals, propaganda-laden politico lyrics. Tis manic teknoid indeed, very weird and quirky, these guys have a sense of humour ... some utterly amazing sound processing, has to be heard to be believed, trust me. ... something very psychotronic about all this... Clever and megainventive, so much in it... out of this world sounds... classy, really have a style all their own. Love them squidgy bass seqs, analogue sounds with much VCF travelling... No, this band are NOT a teknoid dance band at all, that's just the first element you come across... and it misleads you...completely! The most original band I've heard from Australia in all my life, brilliant!" Mick Magic, Music & Elsewhere Newsletter vol. 11 no.1, U.K., 1998.